Kekova, on the southern coast of Turkey, is an area rich with ruins of ancient civilizations and is a true yacht charter itinerary highlight on a crewed yacht charter along the southern coast of Turkey. Visiting Kekova Island and the Kekova area offers the very essence of a crewed yacht charter experience when cruising along the southern coast of Turkey for here you are able to see the remnants of the ancient civilizations up front and personal; walk on the ancient stairways carved into the shoreline, walk on beaches with ancient ruins, and snorkel over sunken harbor ruins, all while enjoying the beautiful crystal clear blue green waters and various anchorages of Kekova and Kekova Island on a crewed yacht charter along the southern coast of Turkey. Kekova Island sits just off of the mainland creating a bay between the island and the mainland and the bay is home to numerous islets. Kekova Island and the islets are thought to have been created in the 2nd century AD, when earthquakes dropped much of the land between the remaining mainland and Kekova Island into the sea, submerging whole settled areas. The new islets and Kekova Island were rebuilt after the earthquakes, over and around the ruins remaining and the area flourished once again until the Arab invasions in the 7th century AD. Traveling by boat became the best way to link the new settled land areas together and remains the best way today, with this ancient area best explored by sea from your charter yacht or charter yacht tender. 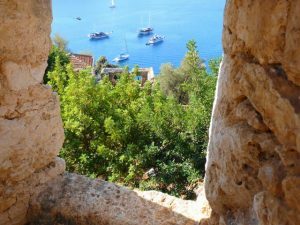 Anchor and visit Tersane Bay on Kekova Island by ship’s tender and see the now collapsed apse of a Byzantine church littering the beach, while on either side, ruins of ancient buildings tumble into the surrounding waters. Back walls of buildings were carved into the soft limestone rock of the island and surrounding areas, with the other three walls built of stone on stone foundations radiating out of the carved back walls. Most of the once harbor front foundations are under water today. This was an extensively settled area and there are many of these carved back walls to be seen in the rocky landscape right along the shore today. And there are many rock foundations to be seen in the waters below from the ship’s tender or, if allowed, to be seen by swimming in the refreshing waters and snorkeling over the remnants of these ancient civilizations. 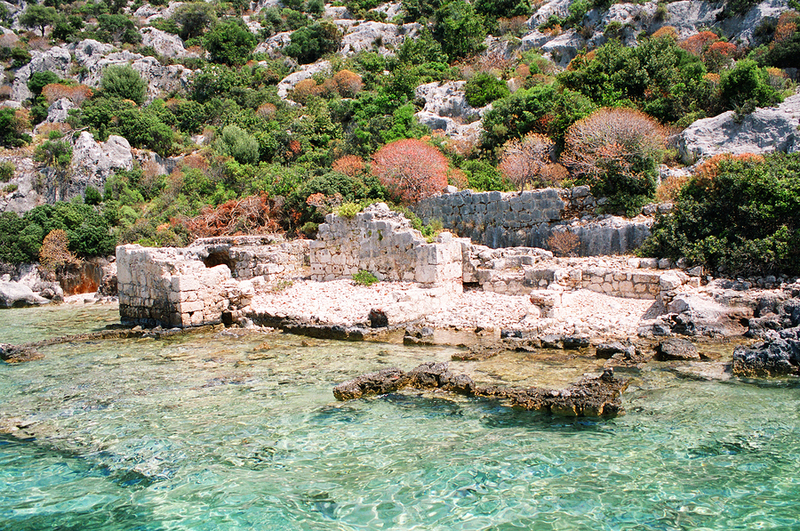 Throughout this area, the inland side of Kekova Island is where the largest amount of the ancient ruins can be seen today. 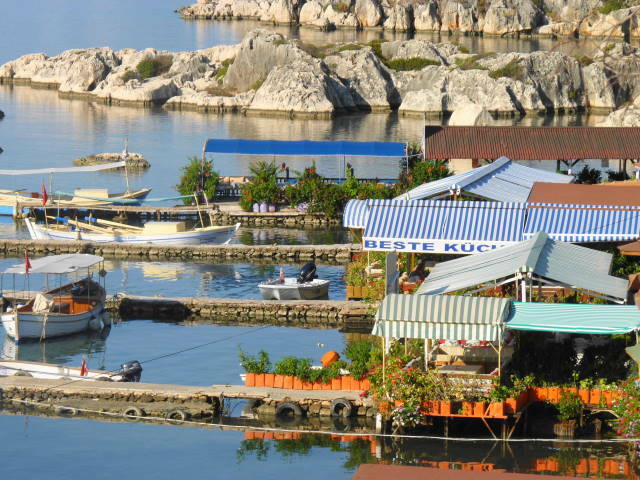 Cruise down the length of the inland side of Kekova Island from one end to the other to grasp the extent of this ancient settlement. 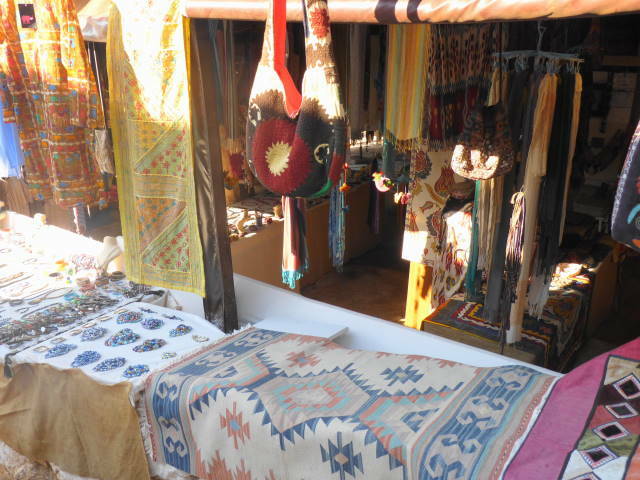 This area is believed to originally have been part of the ancient town of Dochiste, which was destroyed during the earthquakes, and subsequently over the next centuries settlements were rebuilt on remaining bits of land and the mainland. Use the hull of the ship’s tender to fan over the water’s surface to create a “window” for a look at the foundation ruins below for a glimpse of the remains of the ancient harbor front, quays, and mooring stones, for this is an area where the submerged antiquities are protected from swimmers and snorkelers. Look closely and you may see terra cotta shards of amphorae’s, roofing tiles, and sewer and water pipes, all bits of everyday living left behind from life in these ancient cities. 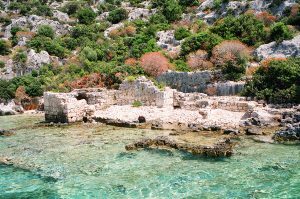 The remains of what was thought to be Teimiussa is to the east of Ucagiz today in the Kekova area along the mainland side of the bay. 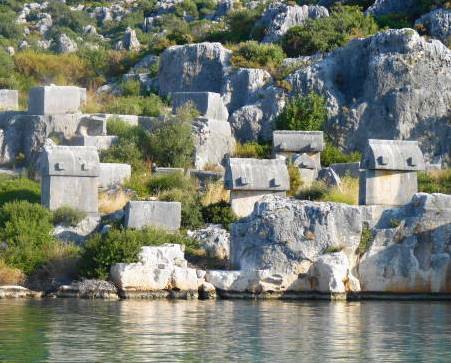 The most extraordinary remnants of this city now are a large cluster of Lycian style sarcophagi that are grouped together along the shoreline on a bit of land sloping away from the water. Many of the sarcophagi bear Hellenistic and Roman dates, suggesting once again that while different rulers conquered this area through the centuries, that aspects of the Lycian culture were continued to have been honored. Across the bay, Kalekoy sits on the ancient ruins of Simena on a small islet capped by the remains of a fortress with crenellated walls. Right in the small village harbor a Lycian style sarcophagus peaks up through the water’s surface creating a lovely and unique photo opportunity. Go ashore in Kalekoy and hike up to the fortress. Close by are the remains of a Roman bath and up next to the entrance of the fortress are the remains of a temple and stoa. The jewel of the area lies inside the fortress; a tiny amphitheater carved into the hillside that seated only 300 people around which the fortress was built. The tiny size of the amphitheater suggests that ancient Simena was a small village. 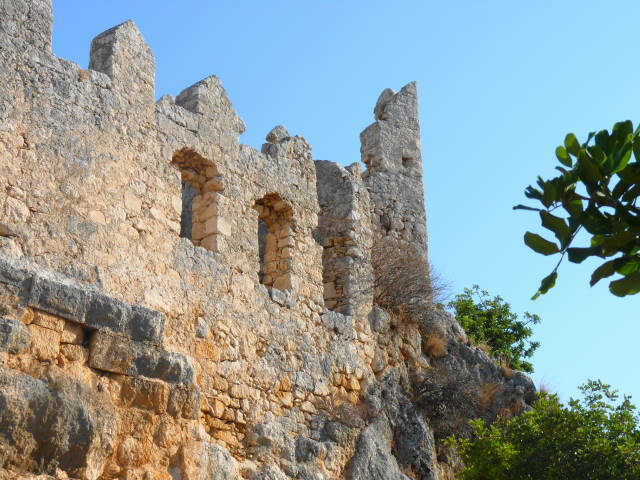 Also inside the fortress are several Lycian temple cliff side tombs. And from inside the fortress is a terrific view of Kekova Bay, Kekova Island and the surrounding area. Several days can be easily spent in this area while on a crewed yacht charter. 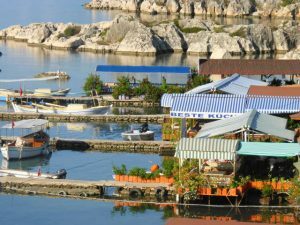 And a crewed yacht charter is probably the best way to truly see and enjoy this fantastic area with centuries of ruins from a vast number of civilizations jumbled on top of one another on land, and strewn across the bottom under the water of Kekova Bay. 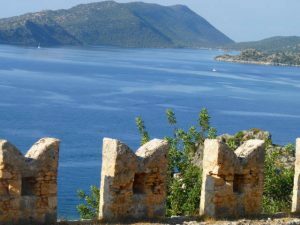 The blend of centuries of history with various important civilizations so evident, the uniqueness of submerged ruins in crystal clear beautiful waters, and extensive landside ruins everywhere creates a truly extraordinary area to visit while on a crewed yacht charter on the southern coast of Turkey.